"I want to be more than a taker. I want to discover how I can give back, too." These were the words of one of the members of the youth leadership who gathered together this past weekend in Ojojona, Honduras. We, i.e. one of our college youth and I, were invited by the Presbytery of Honduras and PCUSA mission co-worker to aid in the facilitation of conversations, Bible studies, prayer, and play as we explored what it can look like to empower the voices of youth in churches throughout the country. There is great hope and power when we discover we are known and have value. When we are given a chance to share our story, passions, talents, and God-given gifts, we are reminded of our significance in God's dreams for the world. 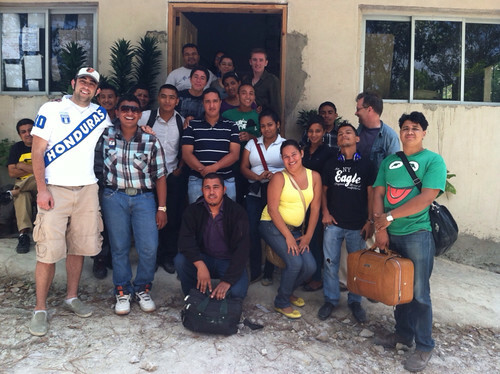 When it comes to youth in Honduras, they are not always given this sort of space and validation. They're expected to fit within particular norms and traditions. Dreams of anything different come as affronts to older leadership fearful of losing [control] of youth in the church. This may not sound all that unfamiliar. But the ramifications are far greater....or at least different. It was a joy and privilege to listen to and read their personal stories and passions that they can then use to make a difference in their churches and communities. This is a question Christians need to ask over and over again. We need to ask not only what we mean when we talk about the good news of Jesus Christ as illustrated in the Scriptures, but also what the good news of Jesus looks like in a particular community, demographic, and cultural context. What is the good news for a teenager in suburban Philadelphia? 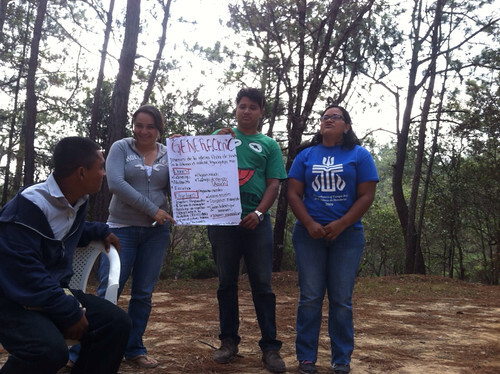 What does good news mean for youth who live in urban and rural Honduras? This week we spent significant time reflecting on this very question, related stories in the gospels, and illustrated how theses stories could speak good news into their congregations and communities. We also explored how the gospel is not only about personal salvation, although that's deeply true, but also an announcement of God's concern for social change and community development. The gospel is an inward and outward journey, for us and the whole world. For many of the Honduran youth leaders, this was a refreshing reinforcement of the inner longings often silenced by many in leadership. For others, this was a difficult message that they are still pondering in light of the understandings they have inherited generation after generation. Wait, God is concerned about those beyond the walls of my church? Again, this is not only a challenge for those in Honduras. 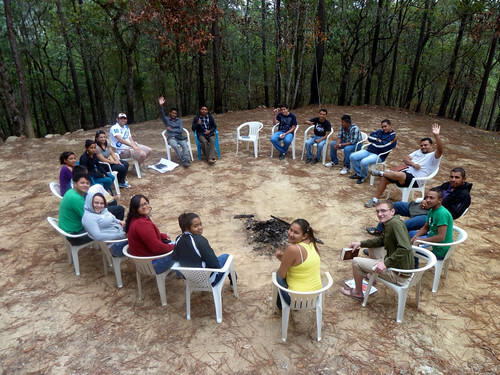 When I arrived in Tegucigalpa and returned to Peña de Horeb, our primary contact within our youth partnership, I was encouraged to learn they had named their youth group: Generación C.
"The 'c' is for change," said one of their youth leaders. There is something about a name that gives power, ownership, and a sense that we belong to something worthwhile and influential. This is why, in 2008, we shifted our identity to "Imago Dei Youth Ministry." That said, at the conclusion of our gathering, each group was invited to share what they would name their group as a means to propel them not only to believe the gospel, but also animate it. How could they put the good news of Jesus into action? They responded with great enthusiasm, as they considered new identities of affirmation and mission. I am excited by what has taken place this weekend. I am grateful to be a part of a new way of doing youth mission with long term dreams and aspirations. I am grateful that we have moved away from service blitzes and into real partnership. I am honored we were invited to share leadership this weekend. 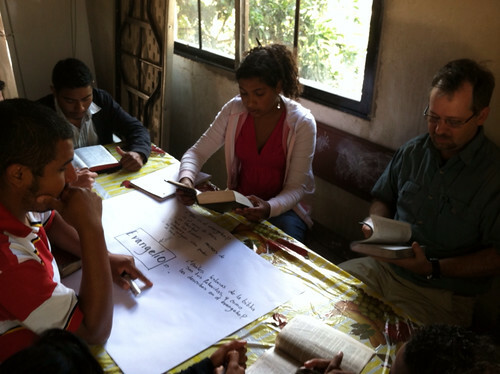 I am also grateful that Imago Dei Youth Ministry and the Presbytery of Honduras can together be givers of the good news of Jesus- to one another and to our neighbors near and far.